Many people think that Xiaomi works only on smartphones. But Xiaomi has a lot of backgrounds and can be said to be everywhere. One of the main parts of the company's strategy is smart home, which can not be thought of without artificial intelligence. Yesterday, the MIDI Xiaomi AIOT 2018 Developer Conference was held in Beijing. The theme of the conference was "Empowering AI, Linking Everything Together." At the conference, Xiaomi announced interesting information on AI and collaboration with IKEA, and described the capabilities of the Xiao AI audio assistant, and introduced new products, including xiaomi mijia smart door lock. Initially, Lee Jun stated that the Xiaomi group had launched the IoT project since 2014, and supports almost 2000 devices with more than 132 million smart device connections. The number of devices enabled by Xiao Ai is about 100 million units. The total number of active devices exceeds 8 billion, and the number of active activists per month is more than 34 million. At the same time, Xiaomi and IKEA achieved a strategic partnership. The IKEA smart lighting line will be connected to the Xiaomi IoT platform in December, supporting voice control of the Mijia App and Xiao AI. This is the first time IKEA has partnered with Chinese technology companies. 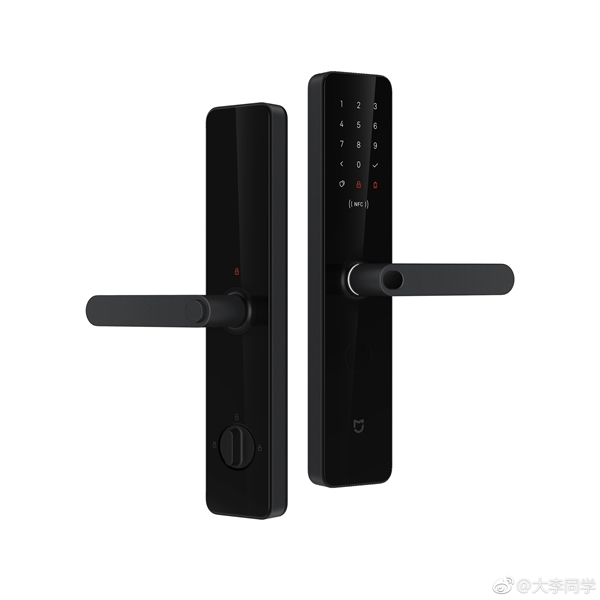 In addition, as it was said, the manufacturer unveiled a new smart product called xiaomi mijia smart door lock, which is compatible with a variety of unlocking and Mijia applications. 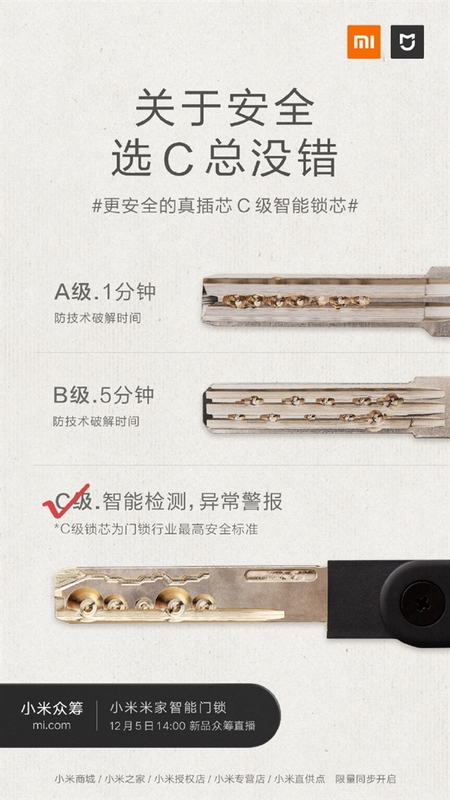 The xiaomi mijia smart door lock is reported to have been designed by the Mijia ID design team. The lock has a C-Class C-Lock core with an original metal clip that supports Live Integrated 3D fingerprint recognition, password, NFC, Bluetooth, and other unlocking methods (a total of 6 methods). There are 7 internal security sensors and over 10 security technologies in the lock. This door lock supports the Mijia App Smart Unicom. Regardless of whether we deal with a traditional door lock or an intelligent door lock, the status key determines the ability to protect the lock cylinder. At present, according to the relevant standards, the door lock core can be divided into three degrees A / B / C, Class C has the best safety. GA / T 73 'Mechanical Anti-Theft Lock' The Ministry of Public Health of the People's Republic of China (MPS) says the time to open the three-layer lock-up prevention technology is less than 1 minute, 5 minutes and 10 minutes, respectively. In fact, when many lock-in thieves see the C-lock cylinder, they decide to immediately pass through it, because the opening process is too long and the possibility of opening it is greatly reduced. So, when choosing smart door locks, you should select Class C Cylinders. Technically, Class A and Class B lock cylinders have given enough tests, and the design of a fake metal block can not guarantee the security of the body lock. However, many manufacturers of smart door locks that do not have the technical capabilities still use class A and Class B lock cylinders and synthetic metal fasteners in their products. For this reason, the Meiji Smart Door Lock is equipped with a Class C lock cylinder with a real metal clamp and the latest model. Compared to other intelligent door locks, the main advantage of the door locks is the support of the Xi'Aio AIOT platform. For example, when the user opens the door, Xiao AI will welcome him, the air conditioner will be adjusted to the proper temperature, and so on. xiaomi mijia smart door lock will be available on December 5 at 14:00.